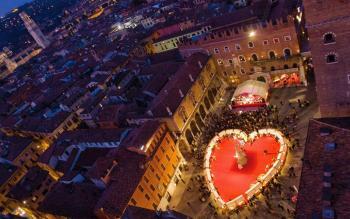 Verona, a UNESCO city, remains the city of lovers and for Valentine's Day, Romeo and Juliet will adorn the city with their eternal love: with lights and typical sweets of the Veronese tradition in the shape of a heart! From the 9th to the 17th February, "Verona in Love" will give you unforgettable emotions with unmissable events: Museums at reduced rates, treasure hunts, guided tours around the city and "Dolcemente in Love" markets in the most beautiful places of the town: Piazza dei Signori, Piazza Bra, Via della Costa and "LoveVerona" points. Unique event in the city of Verona from the 9th to the 17th February from 10.00 to 21.00. Book your holiday the you've always dreamed!